Exploring Cape Town + Penguins! The Atlanta Airport area is home to many, many hotels. Honestly, I’ve never had a good experience at any, but then that has always been due to the fact that the reason that I tend to wind up in those hotels thanks to Delta operational issues. That has meant that I’ve seen everything from the Days Inn Atlanta Airport North to the Days Inn Atlanta Airport South. The last time I had a missed connection, I actually went and stayed in Midtown Atlanta, but that was a different scenario where I was going to be stuck for 24 hours. This time, however I had purposefully chosen to overnight in Atlanta, and thus I actually had a few options. I went back and forth between the various Hilton and SPG properties that surround the airport. There really are plenty of options that I would be able to leverage my Hilton HHonors Gold status or SPG Gold status, although to be honest, for a one night stay where the duration is measured in hours, does status really matter? The answer is that it doesn’t, but hey perks are nice! I had originally intended to stay at the Westin Atlanta Airport. However, for whatever reason, the rates at this property were higher than I had seen in the past, and to be honest, for a barely one night stay, wasn’t really a good points redemption…at least by SPG standards. On the Hilton HHonors front, there were several options around the 20,000 points/night point, which for a quick stay like this is where I want to be for a points redemption. 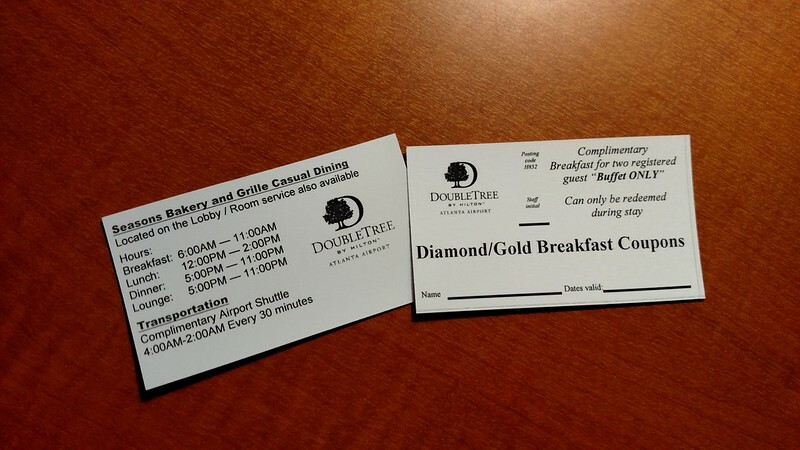 Of the available options, the DoubleTree Atlanta Airport, seemed like the best and safest bet. I was quite tired by the time I had grabbed my bag from baggage claim, and to be honest wasn’t exactly looking forward to dragging my ridiculously heavy duffel out to the hotel shuttle pick up point. Especially on a night like tonight where the bag started feeling heavier and heavier with every step that I took. A thought that often drifts through my head as I stand at any airport’s hotel shuttle area, is ‘why is it that I keep seeing the same shuttles come by multiple times, but why is mine not here yet?’ It certainly at least always seem that way, and tonight was no different. I probably wound up waiting for about 20 minutes until the DoubleTree shuttle showed up to whisk me away to my bed for the night. Like most of the hotels near by the Atlanta airport, the ride wasn’t very long, and I soon myself walking into the lobby to check in. I wasn’t going to be given any upgrade, but at least they did offer me a breakfast voucher, as a result of my Gold status, that was good for the buffet in the morning. The buffet was pretty average, but at least it was a hot meal that I was able to save a few bucks on before I made it back to Panama City. The room, much like the rest of the hotel, was a little bit on the dated side. Oddly enough, I found myself in the ADA-compliant room, which did fortunately mean that I had a ton of space. Not that I exactly need it all the space or anything. Was the room clean? Check. Was the bed comfortable? Check. When you are looking for a quick turn hotel room can you ask for anything more? Not really. Certainly beats out the hotels that Delta seems to offer up to those distressed passengers. Oddly, I only somehow wound up with a single picture of the room, and it was a relatively zoomed in one of the bed. On a side note, this almost seemed like the unceremonious end of my RTW trip. I had gone around the world, and here I was at an almost easy-to-forget airport hotel next to a runway in Atlanta. Just barely a week prior, I had been on a tropical island in the middle of the Indian Ocean. And then there was the fact that I was just a short 43 minute flight from home, but here I was sleeping 250 miles, as the crow flies, from my own bed. It was almost like the delayed end to my trip, but to be honest, it felt like my trip had already been over since I left Japan. As a result, I think this wound up being the most basic, and probably least informative hotel review that I have ever done. It’s one part a factor based on how long it has taken me to get here to this point, but also because I wasn’t even at the DoubleTree for eight hours before I was stepping off the hotel shuttle and back into the airport terminal. 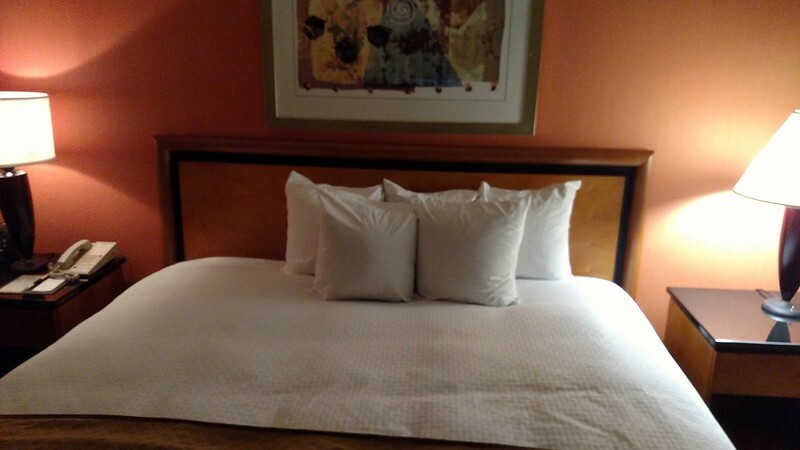 Was this the best stay that I’ve had at an Atlanta Airport hotel? Of course! It’s definitely worth in the future, where if they have availability I would gladly pay up for this hotel on my own versus taking Delta’s provided hotel during a travel disruption. This entry was posted in Hilton HHonors, Hotels, RTW, Travel, Trip Report. Bookmark the permalink. Follow any comments here with the RSS feed for this post. Post a comment or leave a trackback: Trackback URL.